I will be working for wool week recording your voxpops about your experiences of the events, classes and of Shetland. Do come and tell me how you are enjoying your time at Shetland Wool Week. I will be making small audio collages of these Shetland Wool Week voxpops for the organisers and so if you’ve had a lovely time then do come and record it. I will be everywhere during Wool Week (I also have a class or two to take) but follow me on twitter for updates. I will definitely be at the Hub, at Islesburgh and you will also find me at the Stitches from the Stacks on the Wednesday evening at my old stomping ground in the Shetland Library, amongst other places! I can’t wait to hear about all the ways you are enjoying Shetland Wool Week – so if you see me and the mic do come on over! As well as recording for Shetland Wool Week I will be recording for the show too and I would love if you wanted to come and tell me about the meaningful knits in your life. How did you come by the item; was it made for you? Did you find it, buy it or knit it yourself? Maybe it only became meaningful in time or someone else placed meaning on it. We all have a special woollen items in our lives and there can be a story woven in each stitch – about its construction, the wool that makes it, the pattern or the the meaning in the knitting and the wearing. I wrote about my meaningful knit last year and how the Mezquita shawl signified the beginning of the end of one personal journey and a new path in my knitting journey. You might not think your favourite knit or crochet items have a story to tell, but I bet you have items that are special for one reason or another. I am interested whether you have a meaningful knit anecdote or if there is a longer story to tell. If you wanted to bring that item with you then that would be spectacular too. | Don’t forget your HAPS! If you are coming to Shetland for wool week and you knit a hap in our #hapalong then do bring your hap with you! It will be just lovely to see you in your hap and extend the celebration of that wonderful knitalong. Hap chat and knitting is still going on in the KB ravelry group and that makes me so hap-py! If you don’t have a hap, or a meaningful knit or a story to tell I still would love to see any KnitBritish listeners and readers, so do come and say hello! It’d be lovely to put faces and real names to the Ravatars and Twitter profile pics! I’m SO excited abou SWW! I was last there in 2012 and loved it all but I know it has grown and developed in the three years I’ve been away. This time I hope to get to Unst…. My daughter and I will be doing all things woolly whilst my sister and brother in law will be birding, it’s their first time to Shetland so I’m excited for them too! Maybe we can do a knitting/ birding Voxpop! PS I’ll be the one in the Fairisle Tam as Bobble hats don’t suit me???? hey Beryl! I look forward to seeing you and, yes! Birds AND knitting are great topics of conversation! I knitted Baable hats, but then I decided to donate them to the Calais refugees. So I will be wearing one of my Schwook hats from last year. That is fantastic! I have not knit a babble hat so I will be hatless! I will be in the USA on business during Shetland Wool Week but my son Adam will be there. It looks like it will be the best yet and I hope all goes well. There are exciting times ahead for Real Shetland wool. prices to crofters and sheep farmers maintained despite huge drop in wool prices on the mainland! All because we support Real Shetland wool and not imported wool which purports to be the real thing. Look out for the 3 Sheep logo for your guaranteed authenticity and environmentally friendly processing. Happy Shetland Wool Week to all. 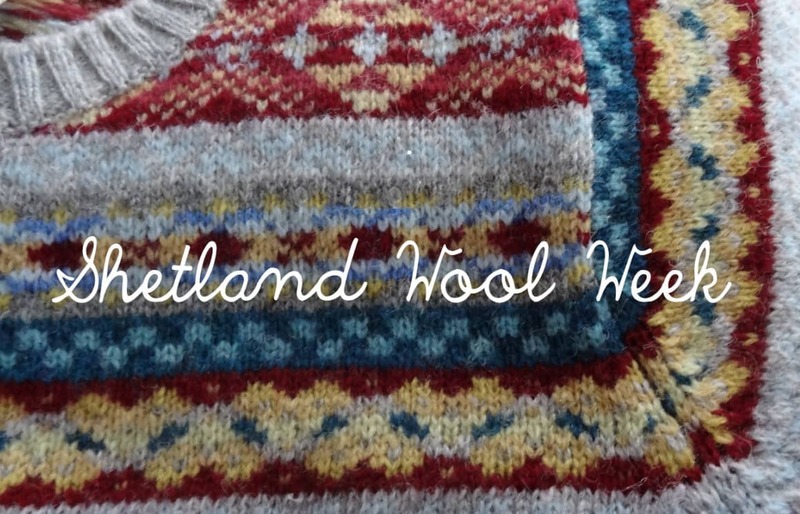 Will be at Shetland Wool Week….this is my second visit. Looking forward to meeting you. I know it isn’t directly relevant but I have been at the Flooring Show in Harrogate for the past few days and I am delighted to say that Wool has really Bounced back! The stars of the show are new wool ranges in beautiful colours and textures and it shows that the future is bright for natural products in all sectors of the textile world. Our marketing programme is based on Woolability! I love that you will be recording people’s Meaningful Knits. This resonates SO much. It is a natural extension of an appreciation for material, skill and items. I increasingly see people go down the minimalism route for environmental/happiness reasons. It is one approach but I think an appreciation of fewer but meaningful items, which are imbued with a story and provenance, is a more joyous and sustainable way of living. I really look forward to hearing what stories you record!